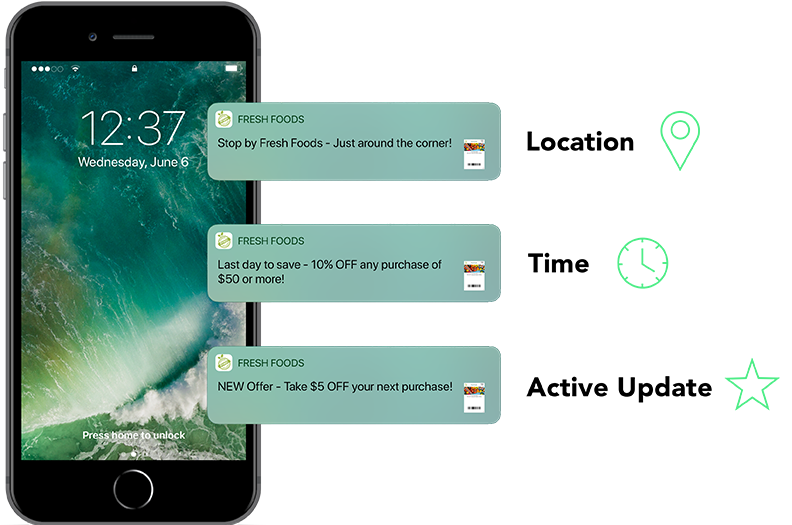 We create Apple Wallet and Google Pay content so that you can stay focused on creating award winning mobile programs. Content can be coupons, offers, tickets, gift cards, loyalty cards, and membership IDs but they can also reward a VIP, announce a new product, or be used to share a seasonal recipe. Our mobile wallet cards are built for and ready to be deployed through any marketing channel. Your customer can “Pop” content from social media channels, video, display ads, even QR and other codes as a way of bridging the physical and digital worlds. The Popwallet button can be added to your site, app or email for pops across multiple devices. We offer multiple targeting strategies to get your message in front of your next customer. Reach audiences based on demographic, behavioral, or interest level characteristics. Discover new audiences with powerful algorithms built and proven to deliver a brand’s KPIs. Deliver a relevant message to people based on where they are or where they’ve been. Reach customers who have visited particular store-front locations or demonstrated other geo-behavioral characteristics. Deliver dynamic weather or event triggered ads with conditional messages to ensure extreme relevancy. Even sync with TV shows to boost your own brand message or conquest that of a competing brand. Our proprietary Wallet Graph™ correlates data across mobile wallets, enabling both audience and contextual targeting based on mobile wallet consumer behavior. Drive customers down the conversion funnel with notifications and other messages. Similar to mobile apps, the remarketing opportunities once a customer has saved your mobile wallet card are near endless. Location – either by GPS or beacon, send your customer a notification when they are in a relevant geographic area. Time – remind your customer that the offer is about to expire or a new product comes out tomorrow. Active Update – business rule based updates of content and messages, for example sending a certain message to a certain audience segment based on certain behaviors. However you choose to message, mobile wallets are an amazing “here and now” marketing channel. We offer multiple methods to capture and process conversion data, from manufacturer coupon and store offer redemption, to event attendance, to gift card and loyalty card usage. Use our reporting dashboard to surface performance metrics including views, saves, and conversions showing attribution for every dollar invested. We work with the best of breed partners for distribution, targeting, measurement, and attribution to ensure all campaigns reach the right audience.